It is a very common snack of Southeast Asian origin. 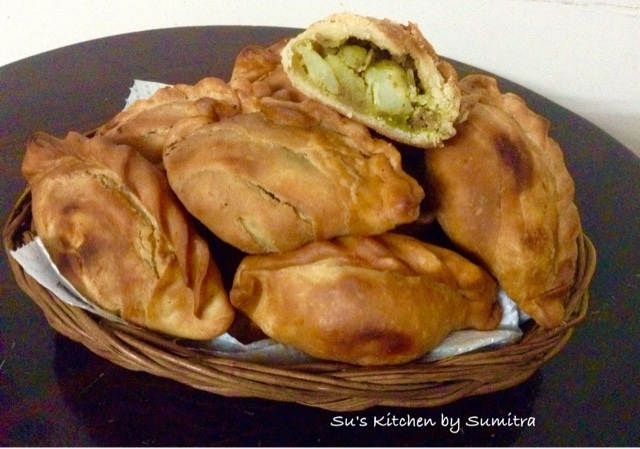 It is a small pie consisting of specialised curry with meat or egg and potatoes in a deep-fried or baked pastry shell, and it looks like the Portuguese stuffed bread called Empanada. Heat oil in a pot on medium heat. Add oil. Heat it. Add the garlic, onion and chillies. 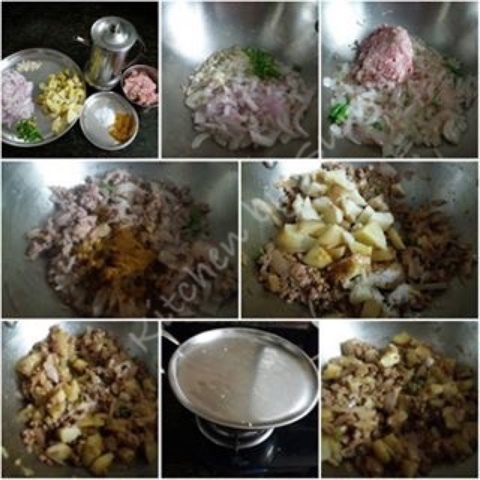 Saute it until the onions are translucent, then add in minced meat. Stir-fry until the meat changes it's colour, add the curry powder and stir well. Add the potatoes and salt, the cover pot. Reduce the heat and cook for 10 minutes. Keep it aside and cool the stuffing completely. Mix all the above ingredients together until well combined into a dough. Cover and keep it aside. 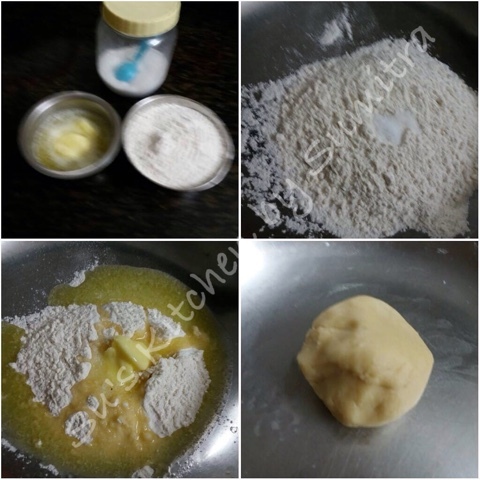 Mix the flour, butter, salt and sugar together. 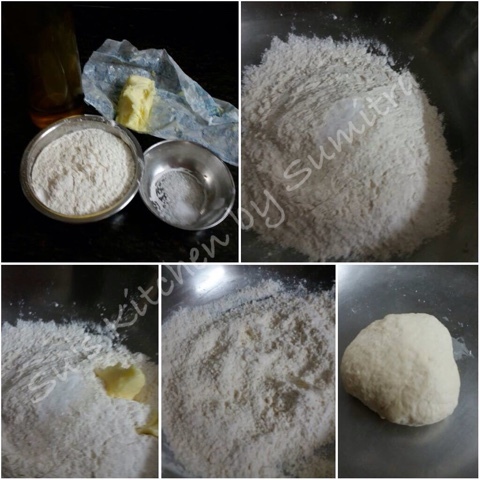 Add water little at a time and knead it well into a dough. 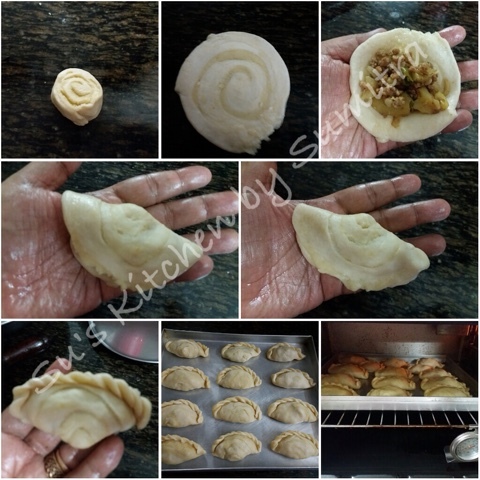 To make the Curry puffs..
Divide the 1st dough and 2nd dough into 3 equal portions. The 2nd dough will be bigger in size than the 1st dough. Take a 2nd dough ball and flatten it. Then place a 1st dough ball in the centre of the 2nd dough ball. Close the edges of the 2nd dough ball. 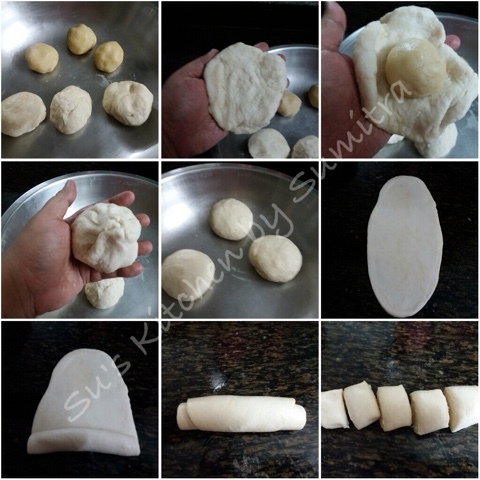 Roll the dough ball into a oval long shape using a rolling pin. Now take one end of the dough and start to roll to the other end. Cut the dough roll into 4 parts. Take a piece of cut dough and place with the cut side down onto worktop surface. Roll out again making sure that the centre of circle stays in the centre.Now it is ready to be stuffed. 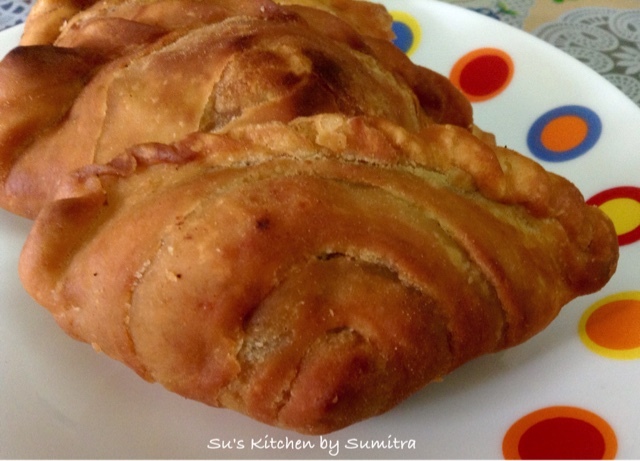 Pick up the rolled dough and place it on your palm. Add the stuffing and fold the dough into half and seal the edges. Pinch the edges and pleat it together. Repeat it until the dough balls are used up. Take a baking tray. Arrange the curry puffs on the tray. 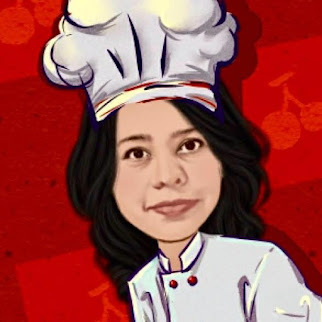 Bake at 180 degrees celcius for 25 minutes or until brown on both top in a preheated oven. P. S. It can be deep fried until brown in colour..